Mira Showers says that it has entered “unchartered waters” with the launch of its first bath range. PBM takes a look at the details. One of the country’s most well-known showering brands, Mira has taken the decision to broaden its portfolio with the launch of the premium Mira Flight bath range. The new product is described as offering superior strength and has been “ergonomically designed to provide ultimate comfort while seamlessly fitting into the modern bathroom”. A removable gel cushion and solid oak bench have been incorporated to ensure “maximum relaxation” whilst the soft radius design, complete with a circular chrome overflow cover and white acrylic panels, are said to bring “effortless style that’s easy to clean”. In addition, the bath allows up to 38cm water depth — reportedly 4.5cm over and above standard acrylic baths. The product’s polyconcrete core and robust square ‘trellis’ design frame have been designed to minimise flexing or deforming, allowing the new product to withstand up to a 490kg load and providing additional peace of mind when it comes to durability. Manufactured in the UK, the range is also entirely self-supporting meaning no wooden reinforcements are necessary and the supplier states that it can be “quickly and easily installed”. 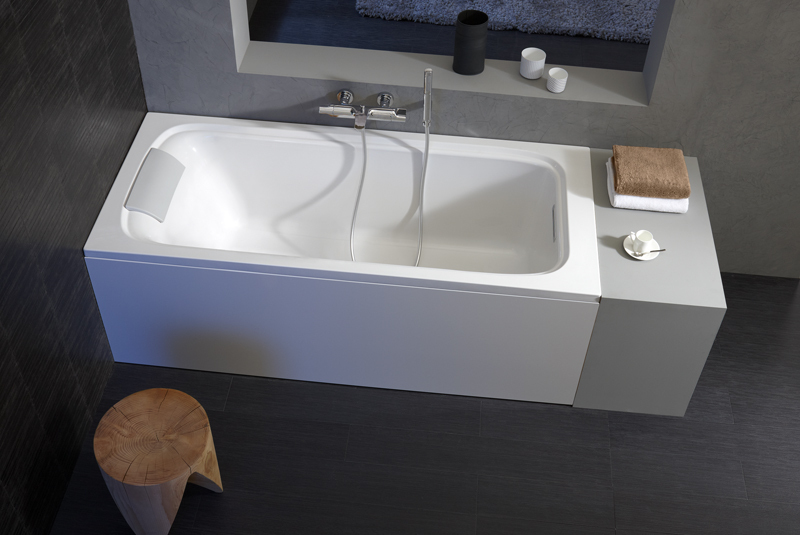 The Mira Flight bath comes in three drop sizes and one freestanding option whilst all products in the bath range come with a 10-year guarantee. Speaking of the rationale behind new launch, Roland Beal, the company’s Head of Industrial design, said: “The bathing market is under pressure from walk-in showering solutions in the UK, but many people still enjoy a long soak and the calming time a good bath can provide. Many showers are installed over baths in the UK and it made sense to investigate bathing options to improve both the ‘in-bath’ showering experience and see what we could offer in a bath application. For more information on the Mira Flight bath, visit www.mirashowers.co.uk.